The Iliotibial Band, also known as the IT Band, is a thick band of fascia that runs down the outside of your leg. If you were to look it up on the Internet a ton of links to information regarding Iliotibial Band Syndrome will come up. Before we talk about the pain the IT Band can cause let’s review what it is exactly. The IT Band is attached in the area of the hip and runs down the outside of your thigh to where it connects just below your knee. 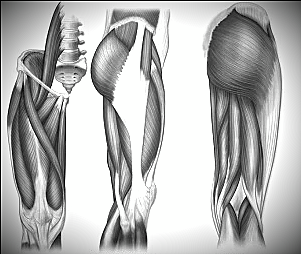 Being fascia, an elastic connective tissue that is found throughout the body, it is responsible for assisting our leg muscles and bones in both moving and stabilizing our legs. For many years the IT bands were thought to be there to keep the hips stable but research has revealed that they have more function in movement than that. Stand up now, take one step, stop and hold that position. The IT Band was active in all of that, and still is if you have continued standing in the lunge-like position. That leg swing, the stopping, and then the stabilizing in that new position. This simple exercise demonstrates the importance of the IT Band. A Yoga instructor once told me that the IT Band is such a strong piece of fascia that it could hold up a car. When the IT Band is at its optimal length it functions perfectly. When it shortens it has the power to pull bones out of alignment, and that’s when we experience pain, especially knee pain. Imagine the knee joint not tracking the grooves it has to track in. The pain come from bones, tendons and ligaments being out of position while we try to carry on with our regular routines. The longer will let this go on the greater the damage. The first step is regulating exercise so that overuse injuries are avoided. Weight management falls under this category as well. Carrying extra weight on our frames is like working out too much on a daily basis. Self massage of the IT Bands is a great way to regularly assess if there is tightness. With your finger tips gently dig into the side of your thigh to find the band. It really does feel like a big rubber band. As you move your fingers along the band stop at the “trigger points”. You’ll know what they are because they HURT. Stay and massage them. Essentially you’re working out the kink that is shortening the IT band. Get to know your IT Bands. If taking care of them means less pain for you is it not worth doing? We’re Talking About Push-ups … Again!